On the California Death index there is a Delbert Wilford Thomas b-24 May 1885 Canada English, d-4 June 1969, San Francisco, California. Mothers maiden name is Dixon. He has 1903 listed as the year he moved to the United States from Canada. Since Marion and Warren were married there in 1880 it is possible that it could be the son. Thoughts? What followed was a thrilling evening of genealogical research. Jeannie and I went back and forth for hours, each person putting one more piece of the puzzle in place with every turn. Eventually, by 1:30am Wisconsin time, we had determined that Delbert was indeed the missing son of Warren Thomas. We had also found two living descendants of his and gotten their phone numbers. I waited until morning to call them, and we have been in touch since then. A more complete version of the story of Warren’s missing son can now be told, thanks to his grand-daughters Sharon & Susan Martin. Delbert Wilford Thomas, or “Skipper” as his family called him, was born on 24 May 1885 in Winchester, Ontario, Canada, the home town of his mother Marion Dixon. His grand-daughters say that his second wife Laura “Tommy” Johnson came from a Mormon family, although apparently Clifford Johnson, the patriarch, was something called a “Jack Mormon”, which sounds something like a “Lapsed Catholic”. He swore and drank, so wasn’t particularly strict. Laura’s mother Millie “Johnnie” Apperly was described as a “cowboy’s wife”. Millie was in the 1906 San Francisco earthquake and was very upset because she left her hat collection in the house and the family wouldn’t let her run back inside to get them when the quake struck. There is also a rumor that one of the commanders of “Franklin’s Lost Expedition” to the North Pole (where there was cannibalism and lead poisoning) was a family member from that side. Delbert Thomas was said to have ridden with Teddy Roosevelt in Cuba when he was only 14 or 15 years old having lied about his age to join the cavalry. Susan said that Delbert’s mother came down to Cuba to pull him out of the cavalry after informing them that he was too young to serve! It was also her impression that he was in the Cavalry in WWI. Laura’s Johnson’s family were horse traders, and Paula Thomas grew up with her parents following a circuit of horse-racing that went from Vancouver to Tijuana, Mexico and back, racing at horse tracks along the way. It was apparently a bit like a traveling circus in that everyone was a band (riders, trainers, owners) and there was some degree of community child-rearing that went on. Susan said that Paula told her about Seabiscuit being in that same circuit and that the rider and trainer of Seabiscuit were friends of the family. Paula and her family moved to San Francisco when Paula was school aged. They lived in the “North Beach” part of San Francisco, which Paula described as having “no prejudice at all”. It was basically a colorblind place where blacks and whites co-mingled in a totally free manner. Later, when Paula was about high-school age the family moved to San Jose and Paula was shocked at the racism that was there. There were big bands that came through with Black musicians and they were treated poorly in a way that she had never experienced in San Francisco. Laura was a WAC or something equivalent in WWI and went back during WWII. Paula went to nursing school in San Francisco and the family lived on the famous Lombard Street where they were apartment managers in addition to their other jobs. Susan said “Skipper” played semi-pro baseball with the San Francisco Seals, although I’ve had no luck proving that part of the story so far. Susan said he was very tall, 6’4″ or 6’5″ and “all knees and elbows”. She has many memories of him sitting in a large chair in his living room listening to the Giant’s baseball games on the radio. Delbert had a boat and Susan has memories of going out on the bay with him. She always thought of him as an “ex-military” man. He had a strict, military-style mustache that was close-cropped and scratched when he kissed his granddaughters. He was also a former dentist and “had a passion for dentistry”, so every time the granddaughters came to his house he was always looking in their mouths and examining their teeth. She described Delbert as a “quiet man” who “lived an incredibly full life”. Delbert “Skipper” Thomas’s first son, Harold Gordon Thomas was born in Hyrum, Utah on 10 May 1912. His mother was Skipper’s first wife, Alice Stuart Richardson Weddell. Alice was a Scottish immigrant who came to the US board the SS Devonia from Perth, Scotland on 16 May 1887 at one year of age. She settled with her family in Shelburne, Vermont where her father Alexander worked as a coachman. Alice and Delbert were married in 1909, and moved to Utah by 1910. They lived first in Hyrum, where Harold was born, then in Salt Lake City. Skipper was working as a dentist at that point. In 1919 she and Skipper split up and Alice took Gordon back to Vermont where they were living with Alice’s family in Burlington in 1920. Alice remarried to David Phineus Carlton Stockwell, and they had three children, one of which survived childhood. His name was Harland David Stockwell Sr.
On 31 Dec 1934, Harold married Dorothy Catherine Fortune, one of the nine daughters (no sons!) of William Fortune and Jennie Casey. Dorothy had been married once before to Richard Joseph Ryan, but it doesn’t seem that they had any children. Around the same time, Harold took a job with the City Fire Department of Burlington, VT, where he worked from 1934 to 1944. In 1945 Harold and Dorothy moved to East Hartford, Connecticut where Harold took a job with the Pratt & Whitney Aircraft Division, one of the largest aircraft engine manufacturers in the world. I still don’t know if Harold and Dorothy had any children, but they hadn’t had any before 1940. Harold died 13 Jan 1975 in East Hartford at the age of only 62. His wife Dorothy died 2 Jun 1987 in the same town at the age of 81. I bought this portrait on eBay only because it was from Winooksi, Vermont, one of the towns in which my family lived during the 1800’s. It shows a young girl, perhaps 14 or 15 years old, in a stylish dress. Based on her apparent age, it may be a confirmation photo. When it arrived, I was surprised to find very faint writing on the back. 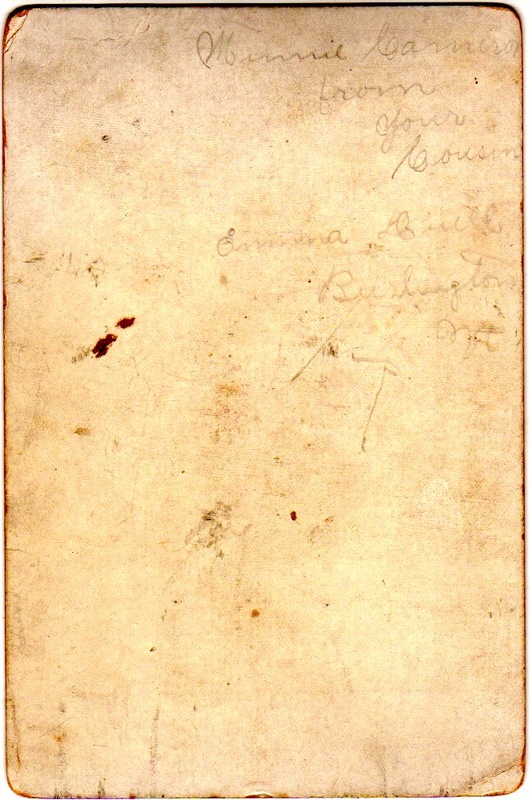 It says “[To] Minnie Cameron from your cousin, Emma Duell, Burlington, VT”. I’ve enhanced the photo here to make the writing easier to see. With the clues provided, I was able to find out about Emma. It turns out she and Minnie were, indeed, first cousins, and also probably double-cousins! Minne Cameron was born in 20 Apr 1883 in South Hero, Grand Isle, VT to John Prosper Cameron and his wife Mary N. Duell. 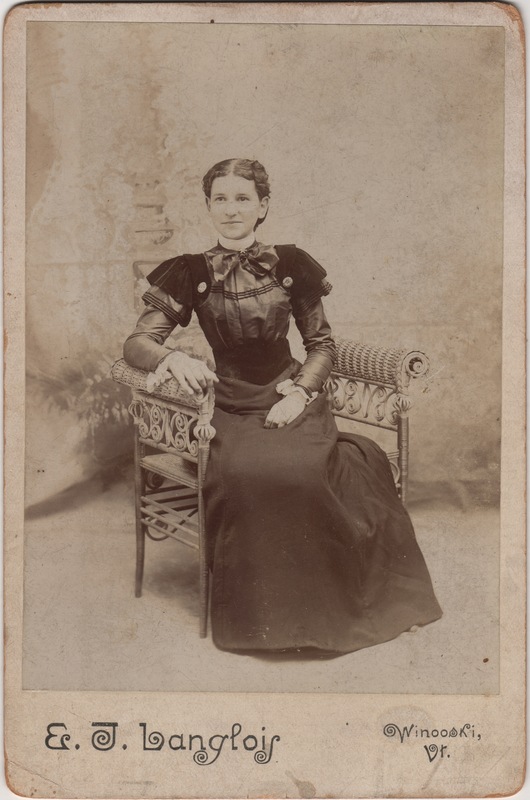 She marrried Charles Fortune on 22 Aug 1900 in Burlington, VT, and a man named James Ritchie. She died 20 Dec 1958 in Colchester, VT.
Emma S. Duell was born 5 Mar 1881 in Madrid, New York, the daughter of Lucius E. Duell (b. Malone, NY) and Charlotte Cameron (b. North Hero, VT). 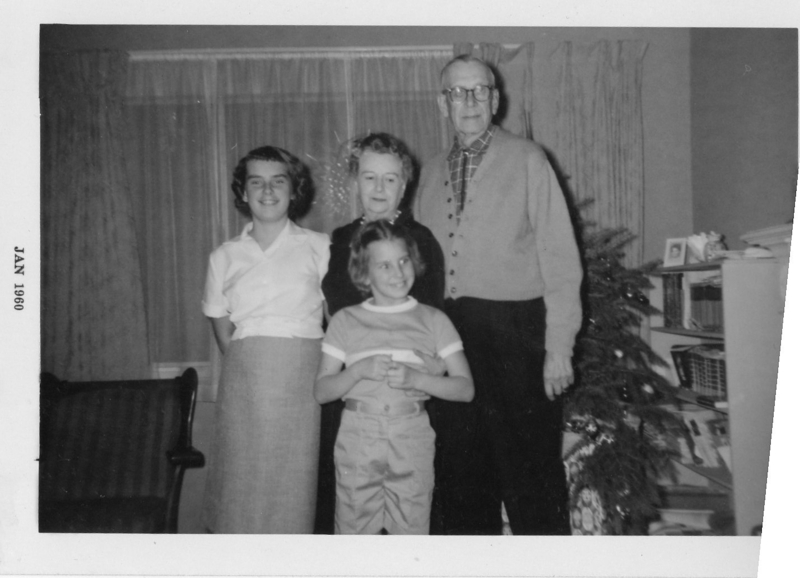 She married John W. Stewart, an Irish immigrant, about 1905, and they had the following children: Rachel Charlotte Stewart (1904-1980), John Edward Stewart (1907-1962), and Robert D. Stewart (1909-1955). 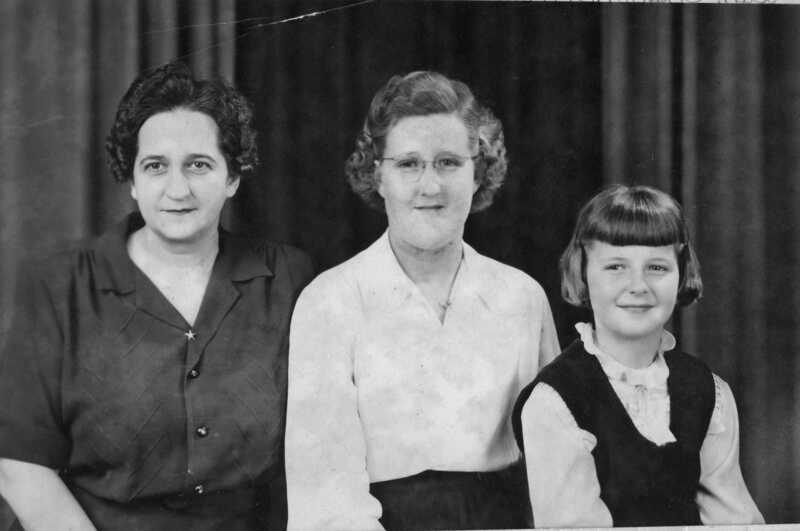 Emma died 23 Sept 1942 in South Burlington, VT.
Rachel Stewart, Charlotte Fuller, and Jean Fuller. Emma’s mother Charlotte Cameron was the sister of Minnie’s father John Cameron. It’s clear that Emma’s father Lucius Duell was also related to Minnie’s mother Mary Duell. I just haven’t quite worked that part out yet. Mary’s parents were Frank Duell and Marceline Gadbois. Lucius’s parents were John Duell and Rosalia Jarideau. Frank Duell was born in Grand Isle, VT and John Duell was born in Canada, so I don’t know if they are brothers or not.